No matter your style, the clean design of our Amish Madison Contemporary Sofa Table can be customized to suit your tastes. 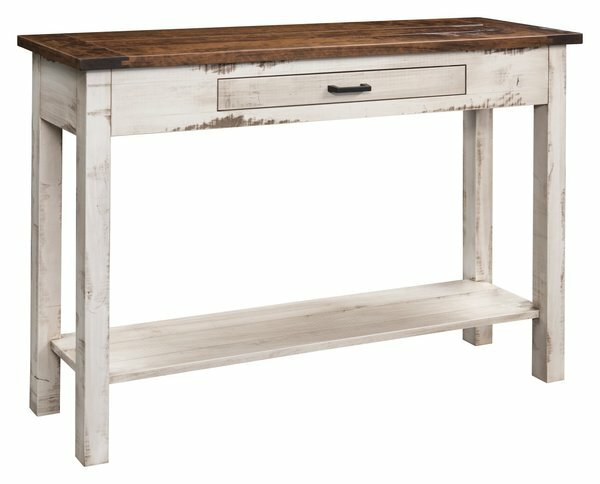 Shown made with simulated barn wood floor marks, this versatile accent table can be made without them. It can also be made from a variety of wood, finish, and hardware options. The center inset drawer and open shelf will help to add storage options while the solid wood top offers a spot for decor like family photos, plants, candles, and books.